It has been a long couple weeks for our BC Bowlers as they travelled over to Christchurch, NZ for the 2016 World Bowls Championships. British Columbia Bowls stars, Pricilla Westlake (Tsawwassen LBC ) and Steven Santana (West Van LBC) are in New Zealand for the 2016 World Bowls Championships. The event which is being held from November 29th – December 11th with play split between Burnside Bowling Club, Fendalton Bowling Club and Bowls Papanui. In Women’s play Pricilla Westlake would play lead for the Fours. It hasn’t been the dream start for Team Canada as the Women’s Fours Finishing in 10th in their section and 19th overall – going 1 win and 8 losses. The bright spot for our National Women’s program has been Ontario’s Kelly McKerihen who rolled through the Round Robin section going 8 wins and 1 loss to finish in top spot. With a bye straight to the Semi-Finals Kelly would would wait for the winner of the Malaysia vs Australia match which would eventually see Karen Murphy getting over the line. 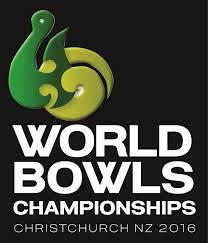 In a tight Semi-final today which came right down to the wire it was the World Champion from Australia that would finish the game strong to win 21-20 and move onto the Gold Medal game, leaving Kelly with an impressive World Bowls Bronze. Congratulations to Kelly from all of Bowls BC members on your fantastic showing. In the Men’s section Steven Santana paired up with Ryan Bester to see if they could rekindle the magic that they had from the Asia Pacific, but in the tough conditions they failed to make it through to the playoffs going 5 wins and 4 losses to finish in 6th position. The Men’s Triples would finish in 8th spot with a disappointing start to the tournament going 3 wins and 6 losses. Up next the Teams will switch disciplines with the Men moving over to Fours and Singles and the Women playing Pairs and Triples. Pricilla Westlake will lead for the Triples while Steven Santana will play in the #2 spot for the Fours. Best of luck to all our players from across the Country!